This essay briefly explores supermassive black holes (SMBHs). It will discuss the tools that astronomers use to find these objects before their link with active galactic nuclei (AGN) is explored. It will be discovered that SMBHs provide the source of energy that produce AGN. The phenomena that we observe from these objects are described by a unified model based primarily upon the angle at which they are observed. Finally the mode by which SMBHs are believed to have formed is discussed. Black holes (BHs) only possess three properties that can be measured (Freedman and Kaufmann, 2007 p 595-596). These properties are: a small electric charge, angular moment and mass. From a distance it will only be the effects of BH’s mass that we are able to detect. More precisely it is the dynamics of stars and gas that provides clues to the presence of BHs. In a review by Kormedy and Richstone (1995) an account of the search for SMBHs in galactic nuclei is given. They state that the search for SMBHs is based on the study of stellar and gas dynamics and eliminating other massive dark objects (MDOs) as being candidates. MDOs, other than BHs, include clusters of low-mass stars, brown dwarfs or stellar remnants and halo dark matter. The search for SMBHs therefore must include the exclusion of these objects as a possible mechanism for the observations. With current survey resolutions this is problematic but there is strong circumstantial evidence for SMBHs in galactic centres. This equation allows the determination of the central mass knowing only the orbit radius of an orbiting body and its velocity. Objects useful for this purpose are stars and gas clouds in Keplerian orbits (Kormedy and Richstone, 1995). The study of gas velocities is more problematic as its velocity is not only governed by gravitational forces. As such stellar dynamics provide stronger evidence of MDOs. Rapid rotation in a galactic nucleus is a good indicator of large masses (Kormedy and Richstone, 1995). This has been found in M31 which is our best candidate for a SMBH. Based on rotation, velocity dispersion and mass to light ratio data the nucleus of M31 contains a MDO with a mass of 3 x 107 Mʘ. The motions of stars in the core of the Milky Way show that our own galaxy contains a SMBH (Ghez, et al, 1998). Further studies by the group headed by Ghez identified a star orbiting an object known as Sagittarius A* (Freedman and Kaufmann, 2007 p 627). This star, known as SO-16, was found to be travelling in excess of 12,000kms-1. Using Newton’s form of Kepler’s third law the mass of the central object is 3.7 x 106Mʘ. The star’s orbit brought it to within 45AU of the central object. The implication of these data is that the central object is a SMBH. Later studies have added further evidence the Sagittarius A* is indeed a SMBH. Using Very Long Baseline Interferometry (VLBI) data Shen et al (2005) were able to show that the mass of this object is contained within about 1AU. Away from the SMBH clouds of gas are found with velocities of between 1000 and 5000kms-1 leading to broadening of emission lines (COSweb). If these clouds are in Keplerian rotation around the MDO their velocities can be used to determine the mass of the central object (Ho and Kormendy, 2002). This broad line region (BLR) extends from 0.01 to 1pc from the central body. The spectrum of the BLR can be used to estimate the BLR size and the central mass in a technique know as reverberation mapping (Peterson and Horne, 2004) which uses high resolution spectroscopy. This technique does not rely on resolving objects so can be used for targets at greater distances but not as far as quasars are located (Freedman and Kaufmann, 2007 p 683). Another tool to determine the mass of a MDO is the Eddington Limit (Freedman and Kaufmann, 2007 p 682). The luminosity of any accreting compact body is restricted by the balance between the in-falling material and the outgoing radiation pressure. Using this relationship the minimum mass of the black hole can be determined based on its luminosity. Radio masers provide a useful tool to identify SMBH due to their high angular resolution that they provide (Ho and Kormendy, 2002). When a disk is viewed edge on this technique provides a resolution greater than the Hubble Space Telescope. This technique provides accurate mass determinations and details about the nature of the rotation of the gas around the central body. Active galaxies are those that have a small very luminous core that outshines the combined light of all the stars in the galaxy (NASAweb). Active galaxies are objects such as quasars, Seyfert galaxies, radio galaxies and blazars. The problem for astronomers was determining the process producing the range of phenomena observed (See table 1). Salpeter (1964) proposed that quasars were powered by the accretion of material onto SMBHs. Table 1: The phenomena observed from AGN types and their characteristics (Modified from Freedman and Kaufmann, 2007 p 680). Quasars are found at great distances from Earth with most beyond a red-shift of 0.3 (Freedman and Kaufmann, 2007 p 671 - 678). The closest one to us is found at 800 million light years. It is thought the many SMBHs have exhausted the available material for accretion and are now dormant. Seyfert galaxies fill the void between the present time and when quasars were more common. The brightest Seyfert galaxies are as bright as the least luminous quasars. Before discussing a model for AGN it is worth describing the structure of these objects (ref diagram 1). A summary of this is given in Freedman and Kaufmann (2007 p 683 - 685). Gravity is the source of energy driving AGN. Computer simulations have shown that an accretion disk forms and with friction this material emits radiation at various frequencies dependant on temperature. In-falling material stops at a sharp boundary due to conservation of momentum. As pressure builds not all the material is accreted onto the SMBH. Instead material is ejected at right angles to the accretion disk to form opposing jets. This material is ejected within a magnetic field twisted by the plasma in the accretion disk. Observations have found that a dusty ring (torus) forms in these systems. At a distance of about 1000 light years low density gas clouds are present. With lower velocities these clouds produce narrow emission lines. This is the narrow line zone (NLZ, COSweb). The structure and features of an AGN and the angle at which it is observed determines how we see these objects. This is the basis of what is known as the unified model of AGN as described in Freedman and Kaufmann (2007 p 685 - 687). If the AGN is viewed from about 90o from the accretion disk plane the object is seen straight down one of the jets. At this angle we see a featureless spectrum produced by synchrotron radiation. This is the situation for a blazer. At a more oblique angle the accretion disk become visible with its intense thermal radiation. The NLZ also becomes visible. Broadening of spectral lines becomes visible due to the Doppler Effect. The synchrotron radiation from the jets still remains visible. In this situation we see a radio-load quasar. As the angle gets closer to the plane of the accretion disk the torus obscures the accretion disk. The visible light comes from the hot gas flowing from the accretion disk giving rise to emission line spectrum. There is no spectral line broadening. Viewed from this angle we see radio galaxies. Seyfert galaxies have weak radio emissions but the division between the two types is still dependant on the angle from which it is viewed. If the BLR is visible we see broad spectral lines. This would be the situation for Seyfert-1 galaxies. 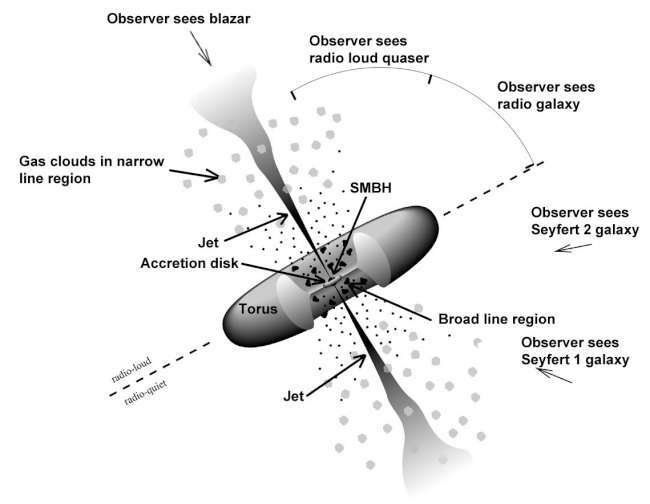 At more acute angles the BLR is hidden behind the torus leading to narrow emission lines producing a Seyfert-2 galaxy. The first formed stars in the Universe may have lead to the formation of SMBHs (Volonteri, 2010). The low metallicity population III stars are thought to have been large due the lack of coolants in the early Universe. If the stars held onto most of their mass before death intermediate sized black holes (BHs) may have resulted from stars sized from 25 to 140Mʘ. It is thought that these BHs may have formed clusters and combined to form SMBHs in a short period of time. However, many uncertainties surround the nature of the population III stars. Volonteri (2010) continues theories of SMBHs formation by reviewing current ideas on the formation of a SMBH directly from a single gas cloud. The inner core of proto-galaxies provided a good location for this to occur. It is thought the gas collapsed to a single point due to the low metallicity in the early Universe. This prevented the cloud from fragmenting to form a number of smaller objects. This model is dependant on a mechanism for the dispersion of angular moment that would prevent the formation of a dense central object. Simulations have shown that a bar structure or turbulent motion may have been the mechanism. In the later case simulations have shown that as much as 90% of the angular moment can be shed from the central region. Once a 104 to 106Mʘ compact region had formed the efficiency and speed of mass accumulation will determine if a massive star or BH is formed. The correct conditions needed to be present to prevent the formation of a massive star rather than a BH and this is problematic. Mayer et al (2010) state that the correct conditions are produced for a BH to form directly from gas clouds during galaxy mergers. The newly formed BHs grow further by the accretion of material from an accretion disk. If the accretion of matter in the single gas cloud scenario is not quick enough earlier formed population III stars completing their cycle may increase the metallicity of the gas cloud. This would increase the cooling efficiency of the gas leading to the formation of low-mass stars (Volonteri, 2010). SMBHs may have formed due to collisions between these stars and the stellar remnants of the population III stars. SMBHs may have resulted from the accretion of material onto BHs formed at the end of the lives of the population III stars (Alvarez, Wise and Abel, 2008). Modelling has shown that a BH may form from these stars if their mass is less than 140Mʘ or greater than 260Mʘ. Alvarez et al state that at z=6 a stellar-mass BH with an original mass of 100Mʘ could have grown to 109Mʘ. This conclusion makes this a viable mechanism for SMBH formation at distances greater than about z>6. It is also possible that SMBHs formed due to density fluctuations in the early universe (Volonteri, 2010). Primordial BHs could have formed if gravity overcame pressures that build as the material collapsed. Astronomers have come a long way since the discovery of AGN. Through the use of different techniques we are confident that the powerhouse of these objects is SMBHs in the cores of these galaxies. Work is continuing and further evidence is required before we can unequivocally state that our understanding is correct. However, there is strong circumstantial evidence that out understanding is correct. Ho, L. C. and Kormendy J., 2002, Supermassive Black Holes in Active Galactic Nuclei, Encyclopedia of Astron. & Astrophys. Kormendy, J and Richstone, D, 1995, Annu. Rev. Astro. Astrophys. 1995, 33, 581-624.